TurboTax owner Intuit Inc. said Thursday that it is temporarily suspending the transmission of state e-filed tax returns in response to a surge in complaints from consumers who logged into their TurboTax accounts only to find crooks had already claimed a refund in their name. “During this tax season, Intuit and some states have seen an increase in suspicious filings and attempts by criminals to use stolen identity information to file fraudulent state tax returns and claim tax refunds,” the company said in a statement. Intuit said a third-party security audit turned up no signs of a security breach with the company, and that the information used to file fraudulent returns appears to have been obtained from other sources outside the tax preparation process. “As it worked with state governments to assess and resolve the recent issues, Intuit took the precautionary step Thursday, Feb. 5, of temporarily pausing its transmission of state e-filing tax returns,” the company’s statement continued. Victims also can see their tax accounts hijacked if crooks assume control over their inboxes as well, since tax preparation services — like most sites — allow users to reset their passwords by requesting a password reset link via email (see my Value of a Hacked Email Account graphic for additional examples like this). And of course phishers frequently impersonate tax preparation firms in a bid to steal credentials. 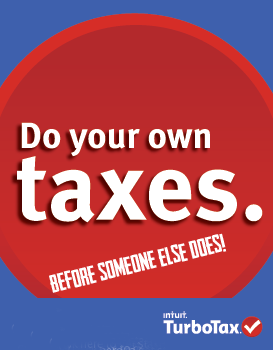 Stolen TurboTax or H&R Block credentials are cheaper and more plentiful than most people probably would imagine. 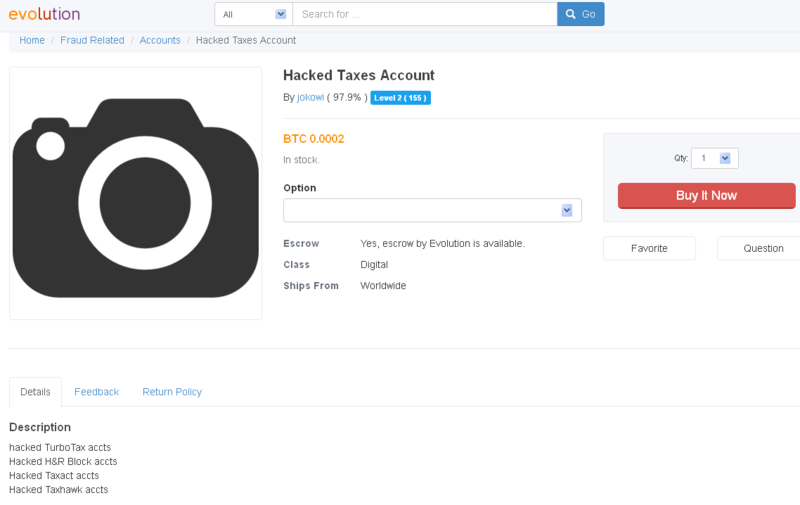 According to the below-pictured well-known seller on the Dark Web forum Evolution Market, hacked accounts currently can be had for .0002 bitcoins, which works out to about 4 cents apiece. A seller of hacked accounts on the Dark Web community Evolution Market sells hacked TurboTax and H&R Block accounts for pennies apiece. Many companies believe that if they protect their intellectual property and customers’ information, they’ve done a decent job of safeguarding their crown jewels from attackers. But in an increasingly common scheme, cybercriminals are targeting the Human Resources departments at compromised organizations and rapidly filing fraudulent federal tax returns on all employees. Last month, KrebsOnSecurity encountered a Web-based control panel that an organized criminal gang has been using to track bogus tax returns filed on behalf of employees at hacked companies whose HR departments had been relieved of W2 forms for all employees. An obfuscated look at the he control panel for a tax fraud operation involving more than a half dozen victim organizations. According to the control panel seen by this reporter, the scammers in charge of this scheme have hacked more than a half-dozen U.S. companies, filing fake tax returns on nearly every employee. At last count, this particular scam appears to stretch back to the beginning of this year’s tax filing season, and includes fraudulent returns filed on behalf of thousands of people — totaling more than $1 million in bogus returns. The control panel includes a menu listing every employee’s W2 form, including all data needed to successfully file a return, such as the employee’s Social Security number, address, wages and employer identification number. Each fake return was apparently filed using the e-filing service provided by H&R Block, a major tax preparation and filing company. H&R Block did not return calls seeking comment for this story. The “drops” page of this tax fraud operation lists the nicknames of the co-conspirators who agreed to “cash out” funds on the prepaid cards generated by the bogus returns — minus a small commission. Fraudulent returns listed in the miscreants’ control panel that were successfully filed produced a specific five-digit tax filing Personal Identification Number (PIN) apparently generated by H&R Block’s online filing system. An examination of the panel suggests that successfully-filed returns are routed to prepaid American Express cards that are requested to be sent to addresses in the United States corresponding to specific “drops,” or co-conspirators in the scheme who have agreed to receive the prepaid cards and “cash out” the balance — minus their fee for processing the bogus returns. Alex Holden, chief information security officer at Hold Security, said although tax fraud is nothing new, automating the exploitation of human resource systems for mass tax fraud is an innovation. Scott Henry scoured the Web for a good deal on buying tax preparation software. His search ended at Blvdsoftware.com, which advertised a great price and an instant download. But when it came time to install the software, Henry began to have misgivings about the purchase, and reached out to KrebsOnSecurity for a gut-check on whether trusting the software with his tax information was a wise move. 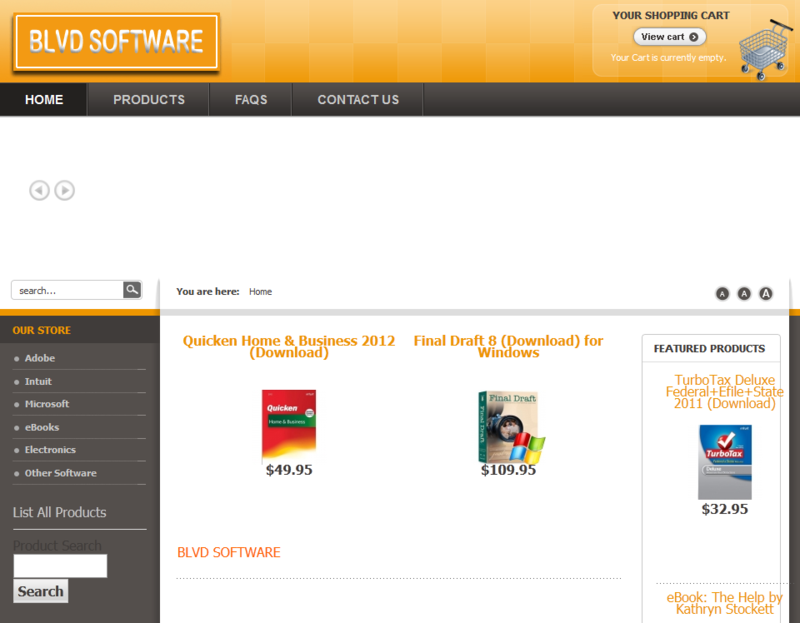 Five days after Henry purchased the product, blvdsoftware.com vanished from the Internet. Several red flags should have stopped him from making the purchase. Blvdsoftware.com claimed it had been in business since 2005, but a check of the site’s WHOIS registration records showed it was created in late October 2011. The site said that Blvdsoftware was a company in Beverly Hills, Calif., but the California Secretary of State had no record of the firm, and Google Maps knew nothing of the business at its stated address. Henry said that in years past, he’d always bought a CD version of the software. But this year, he opted for digital download. “I was going to download from Amazon — they sell a download-only version — and then I saw the cheaper site and went with them,” he said in an email. He installed the program, but said he didn’t enter any of his sensitive data. For one thing, he never received a license key from Blvdsoftware, and the program he installed didn’t request one. Now he’s wondering if the program was — at the very least pirated — and at worst — bundled with software designed to surreptitiously snoop on his computer.